Arsenal Pulp Press, 9781551522241, 243pp. In Dreena Burton's first two best-selling vegan cookbooks, The Everyday Vegan and Vive le Vegan , she offered a dazzling array of healthy, animal-free recipes, many of which were based on her experience as a mother of two young girls she and her husband are raising as vegans. Dreena also maintains an active website (www.everydayvegan.com) and blog (www.vivelevegan.blogspot.com) and has cultivated an enthusiastic audience for her family-oriented, nutritious recipes. In this, her third cookbook, Dreena turns her attention to celebratory food--imaginative, colorful, and delectable vegan fare perfect for all kinds of events, from romantic meals for two to dinner parties to full-on galas. Many of the recipes are kid-friendly, and all are appropriate for everyday meals as well. The book includes 125 recipes and sixteen full-color photographs, as well as meal plans, cooking notes, and advice on vegan wines and beers. Recipes include Lentil & Veggie Chimichangas, Thai Chick-Un Pizza, White Bean Soup with Basil & Croutons, Tomato Dill Lentil Soup, Olive & Sundried Tomato Hummus, "Creamy" Cashew Dip with Fruit, Crepes with Maple Butter Cream, 5-Star Ice "Cream" Sandwiches, and Hemp-anola (Dreena's take on granola). Come celebrate with Dreena and impress your guests with these tempting animal-free recipes. 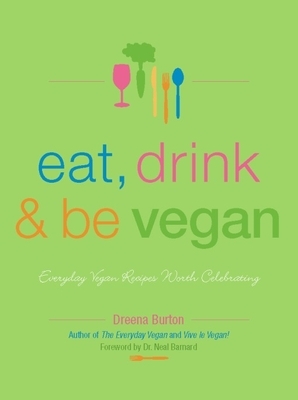 Dreena Burton is the author of the bestselling cookbooks The Everyday Vegan (Arsenal, 2001) and Vive le Vegan! (Arsenal, 2004) and runs the popular blog Vive le Vegan (vivelevegan.blogspot.com). She lives in White Rock, BC Canada with her husband and two children.